Quang Binh has been an extremely famous destination in Vietnam lately thanks to the phenomenal Kong – Skull Island Hollywood movie filmed in Vietnam. 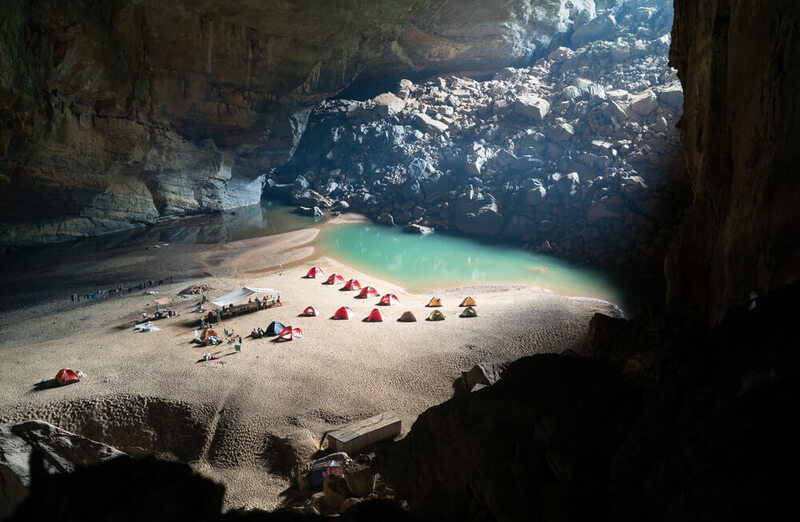 This hidden natural gem of South East Asia is home to some of the largest and most stunning caves in the world. Travel from Ho Chi Minh or Hanoi to Quang Binh in the central of Vietnam to explore various caves and grottoes with the ultimate guide below. Known with one of the most popular caves and national parks in Vietnam, Phong Nha – Ke Bang is the top-rated UNESCO Heritage of Vietnam. One served as a hospital, this natural legacy is nowadays home to lush forests, rugged mountains, and picturesque landscapes. Getting there: the most common way to visit Quang Binh is by booking a local tour on the spot. You can choose to visit Phong Nha cave plus another one. It is also possible to go there on your own, purchase a ticket from Quang Binh tourism and rent a local boat to take you there. 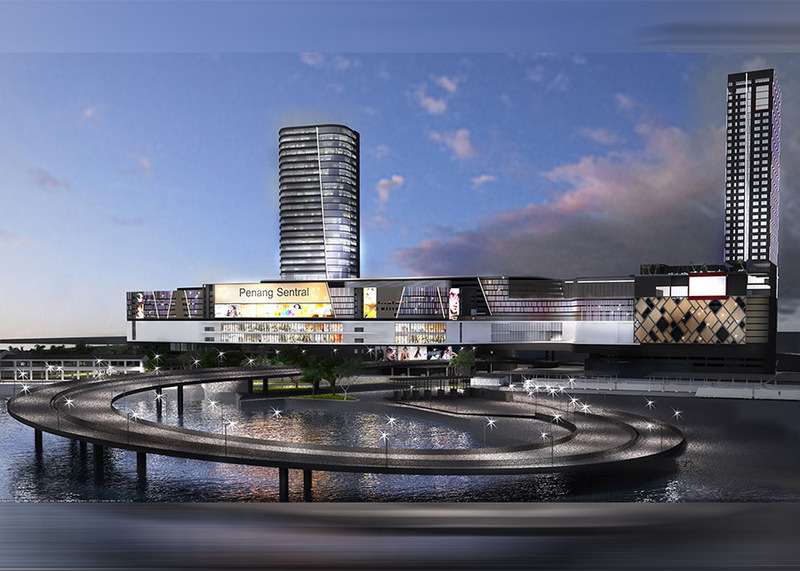 However, this won’t save your much and cost a bit more time to arrange the trip. Paradise cave was covered by the British Caving Research Association in 2005. It was not until 2010 that the cave is open to all tourists coming to see diverse white crystal stalactites with tons of shapes and sizes. The cave can reach up to 72 kilometers high, 150 meters wide and 31 kilometers long – making it the longest dry cave in Asia. Getting there: Entering Paradise Cave can be entered through a dry passage. There is a light system set up along the set of starts followed by a wooden boardwalk within Paradise Cave System, making it easy to venture through the cave. The Dark cave is an adventurous tourist hotspot as there are so many things you could do here: from zip-lining to swimming, kayaking to trekking. The cave itself consists of mostly basalt, limestone, and wild muddy passages. Getting there: Dark Caves is about 50 kilometers away from Dong Hoi in Son Trach village, Bo Trach town. Entering a cave requires a fun zip lining over an emerald river, swimming through a tranquil flow, and walking through a short dark path. Tu Lan Cave system consists of over 10 caves in total, originally discovered in 1992 and explored further in 2012. Crossing Tu Lan cave, you will get to trek through wild jungles, buffalo fields, gigantic limestone mountains and mysterious underground river. You will also get the chance to experience sleeping under the stars in a hammock or a tent next to the campfire, swimming through dark river caves surrounded by gorgeous limestone mountains, and adoring breathtaking sites of tranquil lakes and dazzling waterfalls. 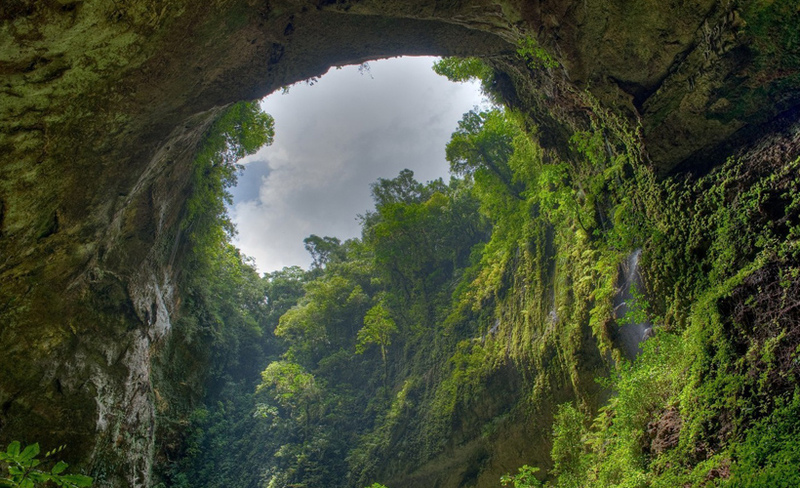 Tu Lan Cave has been a rising tourism spot lately due to being of the filming locations of Kong – Skull Island. Getting there: Tu Lan Cave system is about 70 kilometers way from Phong Nha – Ke Bang National Park, next to Tan Hoa village. Hang En is the world’s third largest cave. The place is famous for its own climate, jungle and a beach with clear water and white sand. Discovered in 1994 by a famous British explorer, Hang En has ‘rooms’ standing 320 feet night and spanning up to 600 feet across. 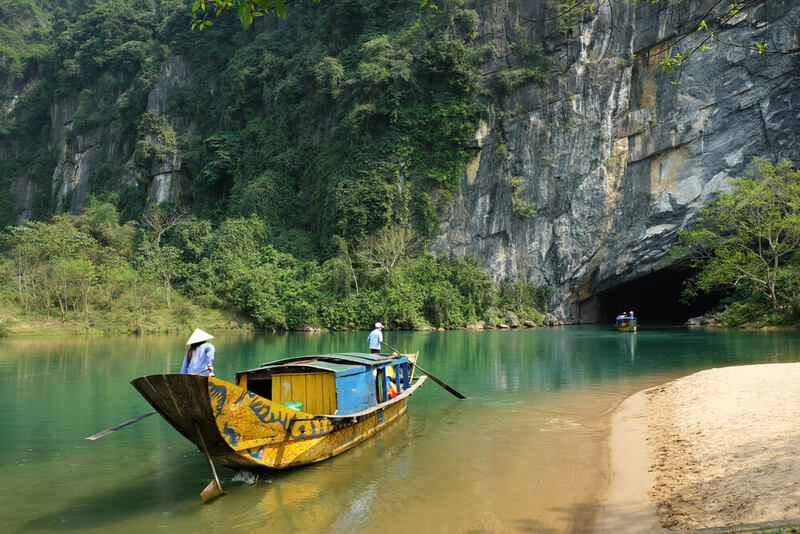 This hidden natural treasure is still an off-the-beaten-track for tourists to Quang Binh. Trekking through En Caves requires at least 2 days including 1 spent at an overnight camp. Getting there: Experiencing Hang En is only possible with Oxalis travel agency by a two-day and one-night trekking tour. 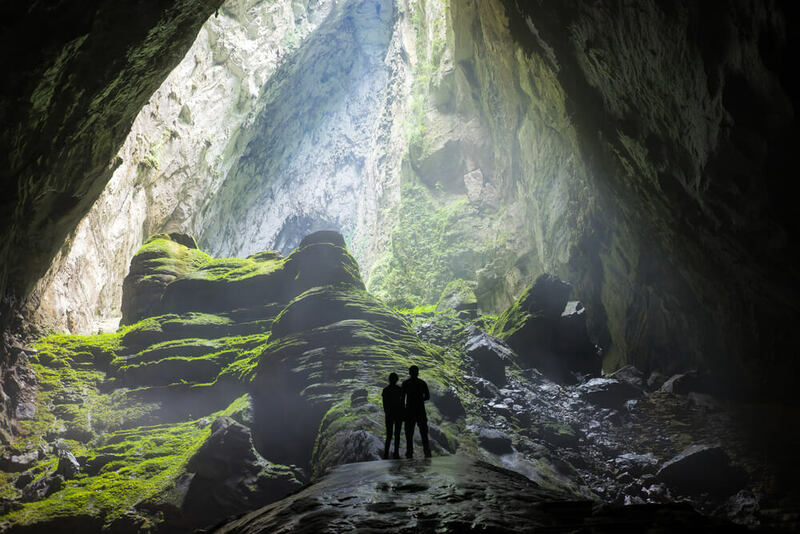 Recently discovered also by the British Cave Research Association in 2009-2010 and open for visitors lately in 2013, Son Doong Cave is the largest cave in the world. This famous massive cave is known for some of the tallest stalagmites in the world and huge skylights created by the collapse of weak limestones. Its cave passage is also the largest known in the world. Getting there: A guided trek to Son Doong requires a full week of hiking, camping, and a budget-busting $3,000+ price tag. Travelling on your own through Son Doong is now allowed. Reservation to explore this cave requires even a year of reservation ahead. The most common and convenient way to get to Quang Binh is by day or night train or flights from Hanoi or Ho Chi Minh to Dong Hoi station. From here, you can either book a tour or rent a car/motorbike to explore the caves on your own. Trekking and climbing through caves in Quang Binh require experiences and safety knowledge. Thus, booking a tour is recommended. 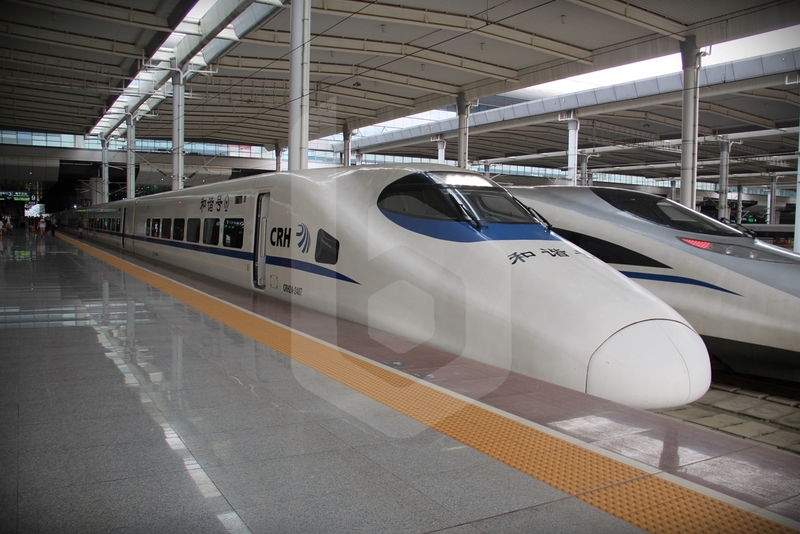 Reserve your e-ticket with Baolau to travel by train in Vietnam without hassle.